I am looking forward to our next meeting October 25. Why? ....because it is a fun and an interesting social gathering. This is my last meeting as president of the Fair Oaks Historical Society. My biggest gift over the past six years serving FOHS as treasurer and president is being associated with and knowing the members of the FOHS. Dr. Bob Barrett has put together a great slate of officers who will carry on the traditions of our beloved Fair Oaks Historical Society. Our last Board meeting went as smooth as silk even though some members were absent. Bob Brugger went hunting out of state. Bob, we have lots of deer in Apple Hill. Meg Smart went to watch her grandchildren play football. RoseAnne is still on her honeymoon. Bob Massey is counting his money. June, our Parlimentarian, is recovering and is at home. Otherwise the rest of the Board had a good meeting. Let us remember, "friendships - not issues" should be the Fair Oaks Historical Society motto! 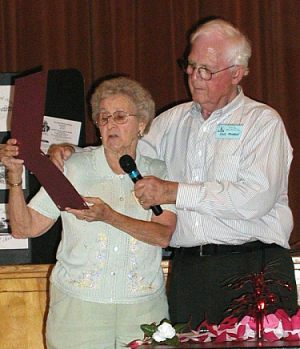 Lois reading the Certificate of Appreciation from the F.O. Cemetery for Memorial Day participation. 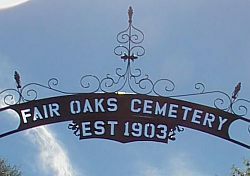 "History of Fair Oaks Cemetery District"
Ray Young, the Manager of Fair Oaks Cemetery District, will be our guest speaker at the October 2005 general meeting. Ray will speak of the Fair Oaks Cemetery's history which started in 1902 and of the the annual events such as the Memorial Day Celebration and Avenue of Flags. If you drive by the 7780 Olive St. site, home of our history museum, you will see their expansion project in process. 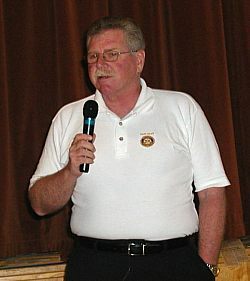 I would like to take this opportunity to thank Jim Purcell, the President of the Fair Oaks Rotary Club, for being our guest speaker at our July 2005 general meeting. Jim spoke to us about the history of Rotary and especially Fair Oaks Rotary which has been in existance for over 60 years. He spoke of the many services for our community, their activities and social events. He brought a number of scrapbooks to share with our membership. Fair Oaks is honored to have the new four-faced clock tower in our downtown which was donated by Rotary. Members of the Fair Oaks Historical Society brought good food to share. We are the best potluck in town! In January, the program will be a potpourri of stories from the membership about their memories of Fair Oaks. I will provide you with the topic at the October meeting. If you have an idea or suggestion for a future program topic please let me know. I want to bring historical topics of interest to all of you. I can be reached at (916) 944-4812 or via my e-mail address at sherrywood1949@yahoo.com. Great news! The book, Images of America Fair Oaks by Professor Lee M.A. Simpson and Paul J. P. Sandul is on its way to Arcadia Publishers. It should be on the bookstands this winter. 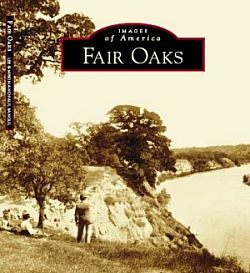 This pictorial history of Fair Oaks uses the pictures that Fair Oaks citizens, community organizations, and businesses have provided to the authors this summer. The book will not only show some of our history but it will tell readers who we are, where we are and how to contact us. The Fair Oaks Historical Society (FOHS) will be receiving the royalties from this publication. We will also be using this book as a fund raiser. Arcadia Publishers will sell the book to FOHS at a discount and FOHS will sell it for $20, using the proceeds to help with the museum, the website, and other projects. I would like to thank those that donated photos for the book. Without the support of community members, this book would never have happened! At the October, 2005 general meeting, a sign up sheet will be available for ordering books. As soon as the books arrive, members will be contacted. Make sure you, your family and friends order their books from the Fair Oaks Historical Society. You may also call Sherry Lynn Wood at 944-4812 to order copies of the book. A Nominating Committee of three active members was elected at the July 2005 general meeting. The members include Chairman Robert T. Barrett, Mickey Showers, and Lillian Jones. The docents on July 10 were Meg and Larry Smart. A record number of 18 people visited the History Center on that 2nd Sunday! August docents were Charlie Blatchford and Ralph Carhart. In September, docents were lone Radonich and Sherry Lynn Wood. Thanks to Charlie Blatchford for getting our notices in the newspapers so that we have good attendance. The following people have also been docents this year: Fran Sargent, Lois Frazier, Gordon and JoAn Heidt and RoseAnne Lamb. Thanks to all. Two new exhibits are at the History Center. One is a memorial to Iva Langness who passed away recently. The other is the Gordon Heidt collection from his father, Charles H. Heidt, of World War I memorabilia. The History Center is open to the public every 2nd Sunday of the month from 1:00 to 4:00 P.M. in the Administration Building in the Fair Oaks Cemetery. If you would like to be a docent call 967-2967. IVA was born in Fair Oaks in 1908, graduated from San Juan High School and attended San Jose State College. She married Norman Langness in 1929. If you look up the meaning of the name Iva, you will see that in Hebrew it means, "God�s greatest gift�. We all know that! You don�t need to do research to understand how special Iva was to her family (real and adopted), her many friends, and her community. Iva liked to do a lot of different things; gardening, reading, organizing everyone... And real important, was talking to family, friends and interesting people. She never did understand why men didn�t seem to have the same interest in prolonged conversation. She had her opinions! And she was never reluctant to share them with family and friends! But sometimes would retort, �I just knew it would be better to keep my mouth shut on this one." She had her own mind but at the same time had a very unique way of accepting people, different viewpoints and change. Iva was a great historian and story teller! She would tell us who lived where and what things looked like in the old days. One time we were driving down Winding Way and she pointed off to an area and said, �We used to own that. But during the War we were broke and needed cash. So I called Norman and he said sell the property. So we did for a thousand dollars---a lot of money in those days. But you just can�t look back! We did what we had to do�. 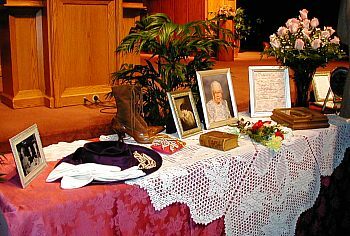 Her stories were all about her family and many friends, the fun and times they had living in and around Fair Oaks. They were a community and she was one of the leaders. 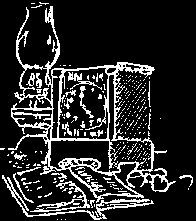 The web team is a little shy of our usual numbers these days, with Joe and Ken traveling around Europe, but we are working on some bells and whistles while keeping the meeting schedule up to date and producing the web version of the newsletter. If anyone comes across a website that has historical material on the area, please let us know (webmaster@fairoakshistory.org). Comments: The original 20 acre property ran east to Kenneth Avenue and south to Winding Way. Mr. Dickson was from Missouri. He raised citrus until he was wiped out by the freeze in the early 30's. 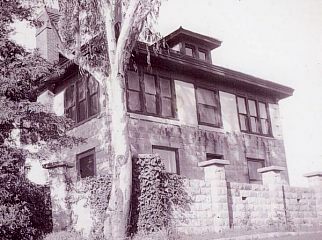 The original home was on this sight but in 1903 -1906 he built the home that is standing today. He made the bricks that the house is built of by using a mold and cement. The pool is possibly the first pool in Fair Oaks which was built in 1938 and there is a pool house near by. The pool is fully tiled. The house is 5500 sq. ft. presently which includes a very large basement and an attic room. Leo Malek, second owner, subdivided 18 acres. He is the owner that built the 40 foot long, 11 foot deep pool. The third owner, R.F. Richardson, built a wrap-around porch and reconstructed the roof line. The present owners, Don Kenmonth and Jennifer Miller, have remodeled the kitchen, baths and attic while trying to maintain the integrity of the original home. They have also restored the barn and pool house. Jennifer has developed 5 lovely garden areas, one of which has a water feature.